Jennings, 54, (not to be confused with Jeopardy! champ Ken Jennings) has started 40 businesses in 35 years. An impressive streak -- until he admits that most of the businesses failed. "But that's what entrepreneurship is about," he said. "We do what others won't do so that later on we have the freedom to do what others can't do." After 22 years of "dabbling" in his startup ideas -- everything from selling exercise equipment and office supplies to running an auto service station -- Jennings hit on his most successful one in 1995. 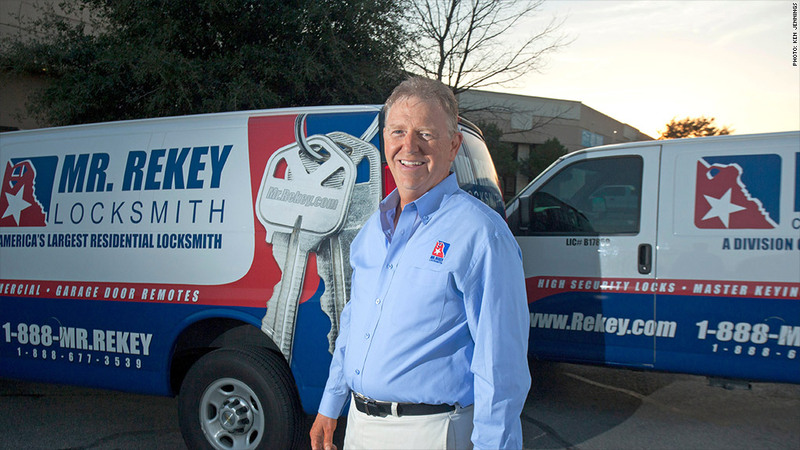 It was a residential locksmith service called Mr. Rekey, which he launched out of the trunk of his mom's car when he was 35. It took a decade for the business to reach its first million in sales. Today, the Austin-based firm generates annual revenue of almost $8 million, employs 100 people and is a national franchise. "With Rekey, I finally figured it out," said Jennings. "If I'm bootstrapping a startup, I have to be prepared to not give up too soon." That's what he did with all of his other startups. "I'd hit a wall in six months and not know how to take the business to the next level," he said. "I'd go get a job until the entrepreneurial itch struck again, and I'd fall back into the same cycle." The pattern stopped with Mr. Rekey. Six months after starting the business, he still wasn't making money but he didn't bail on it. He hasn't looked back since. Jennings says he loves the "game of business." "I like taking educated risks and seeing something grow out of it," he said. He got a taste of this after launching his first startup at 13. It was a door-to-door seed-selling venture that he pursued out of necessity. "My dad was an alcoholic who couldn't hold a job and drank up the family money," said Jennings. "If I wanted toys and cool clothes, and later on a car, I realized that I had to make it happen for myself." He made $400 in the first year and $1,500 the next year. "I couldn't keep up with demand," he said. But that early startup experience taught him basic fundamentals about entrepreneurship. "At 14, the important lesson I learned was that it's a lot about relationships," he said. Over the years, Jennings has crisscrossed the country to launch his ventures, which has come at a cost to his personal life. He uprooted his son and daughter several times during their childhood (although both now work at Mr. Rekey's corporate headquarters). He also separated from his first wife and subsequently remarried. "Being a serial entrepreneur isn't for everybody. You have to have that itch in your blood," he said. As he continues to grow Mr. Rekey, Jennings is also involved in five other startups that he helped launch, including a garage door installation service and a house flipping venture with his wife. Still, life isn't all about business. Jennings works half days and took a month-long vacation to Costa Rica last year. So what's on his mind lately? Jennings said he's starting to think about selling Mr. Rekey. "In a way, it would be nice to be free of it to start something else," he said.